A historic school next door to the High Point neighborhood is getting its very own "extreme makeover" — without the television cameras or megaphone-screaming host. The Youngstown Center at 4408 Delridge Way SW will unveil its new look in early 2006 as it goes from vacant building to community cultural hub. 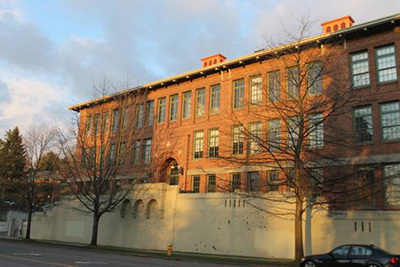 Originally built in 1917, Cooper School is the third community building project spearheaded by the Delridge Neighborhoods Development Association (DNDA), a private, non-profit community organization formed in 1996. The building will have an arts focus that includes permanently affordable, live/work housing for low-income artists on the top three floors. On the ground floor, cultural tenants — including the Nature Consortium, Arts Corps, the Power of Hope and 12th Night Productions — will commingle with a 150-seat performing arts theater, art gallery, dance studio, and other multi-purpose spaces for arts and cultural organizations. In addition, larger arts groups such as the Seattle Symphony and Pacific Northwest Ballet have committed to both performing and sponsoring workshops at the school.